Before you tell me about all of the ways extreme meal-prepping has saved you time and money, let me say that I totally get it. It absolutely works for some people. Of course you can save money by purchasing things in bulk, having things prepared to eat all of the time to reduce the temptation to eat out, etc. I think it’s really awesome when people can get this to work for them, because I’m all for anything that makes life easier and saves money. Monday: Use the pre-sliced veggies and chicken that I prepped over the weekend and make a delicious, healthy, quick meal and feel super proud of myself. Tuesday: Pat myself on the back for throwing the beef I cooked a couple of days ago into an awesome, mess free stir fry. Yay me! Wednesday: Feel happy about the lunch in the fridge that’s packed and ready for me to take to work, even though I should probably use the leftovers from last night. But still, I’m totally killing it. Thursday: Forget my lunch in the fridge and buy something to eat at work. Get invited to happy hour. Cook some frozen dinosaur shaped chicken nuggets for the kids and my husband picks up something for himself on the way home while our prepped food starts to get a little slimy in the fridge. Leftovers from Tuesday and Wednesday sit in tupperware containers. Friday: Go have dinner with Grandma and Grandpa last minute. Leftovers and the planned food from the last two nights continue to sit in the fridge and become less appetizing by the minute. Saturday: Decide to run to the store real quick and grab something to BBQ, it’s too hot to turn on the oven for the enchiladas I had planned for dinner. Sunday: Throw away a bunch of gross stuff in the fridge, debate whether or not to wash the tupperware or just throw it in the trash, and write a whole new long shopping list of things that won’t get eaten. I’ve repeated this scenario more times than I’d like to admit. Every time I feel so optimistic that it’ll work out, and every time I end up with a lot of food (and money) going to waste. What I’ve found is that the beginning of the week is awesome, but it NEVER lasts through the whole week. There’s always too much food leftover, or not enough time to cook it all before it gets gross. And by the end of the week, the produce is always starting to look less than optimal. So here’s what’s been working instead..
Plan meals in 3-day increments. I’ve found that the first three days of the week after grocery shopping are the most successful. After that, I start slipping up by eating out, not getting around to eating leftovers, etc. So now I only plan our family’s meals 3 days in advance. This actually works really well. Not only do we end up sticking to the plan, but the food is fresh and we end up eating more fruits and veggies. It also feels like a lot less pressure mentally when you don’t have to plan so far in advance. I have a quick list of our most common grocery items in the notes section of my phone. Things that we use on a daily basis like milk, bread, oats (for my kiddos morning pancakes), etc. I can add various things to the list, but the core group of items never really changes. I put a check mark next to the things we need before I go to the store, making my shopping trip more efficient and less likely that I’ll buy duplicates of things we don’t need. Before you start your plan, take inventory of your ENTIRE kitchen. Look through the fridge (better yet, clean out the fridge) before you make your list. Also look through the pantry, cupboards, etc. I can’t tell you how many times I’ve come home from the store and am putting things away, only to find that we now have 3 bags of rice and 6 cans of the same refried beans. Brainstorm meals that would best utilize what you already have. This has almost turned into a game for me. Pretend like you’re on the show “Chopped” and can only use the ingredients you have on hand. Try coming up with clever meals based on what’s already in your kitchen. 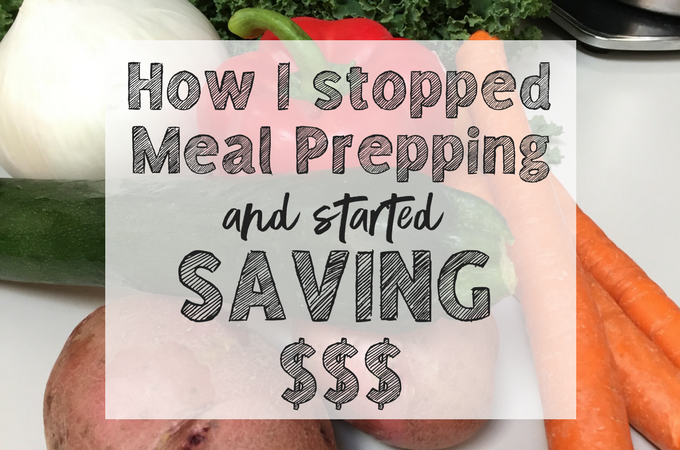 You’ll save money by using food you already have, you’ll waste less, and you may actually come up with some awesome recipes and dinner ideas that you wouldn’t have otherwise. Then you can add a few things to complete the meal that you came up with, rather than buying every single item for each meal every time you go to the store. Make time when you get home to prep all of your produce so it actually gets used. This is a big one for me. When you allot time to go grocery shopping, add in an extra 45 minutes or so to deal with your produce before it even gets put away. Wash berries and slice vegetables, cut up that cantaloupe and maybe even portion out some grapes. That way they won’t be out of sight, out of mind, sitting alone in the vegetable drawer to rot while you stand at the fridge debating on a snack. It makes a quick snack easier, but also means you’re more likely to throw that sliced zucchini into your pasta sauce or pack those carrots in your lunch.